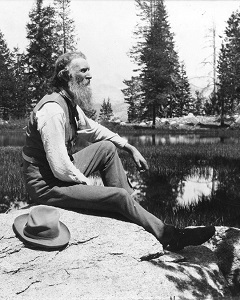 Scottish-born American naturalist, inventor, writer, rover, and crusader for wilderness preservation. John Muir was a lifelong pacifist who moved to Canada during the Civil War conscription. He was a mechanical wizard who refused to patent his inventions because “all improvements and inventions should be the property of the human race.” When a factory accident temporarily blinded him, young Muir resolved to devote the rest of his life “to the study of the inventions of God.” Upon regaining his sight, he set off alone on a thousand-mile botanizing walk from Indiana to the Gulf of Mexico.